After the success of its previous commercial projector series, ViewSonic announces the whole new Pro8520HD Full HD 1080p high brightness projector designed for mid- to large-size conference rooms, theaters, museums, and exhibition halls. ViewSonic provides the full-featured Pro8520HD as the solution for mid- to large-size enterprises and auditorium needs for professional projection. ViewSonic's industry leading projector, the Pro8520HD, is a Full HD 1080p model packed with 5,000 lumens and a high contrast ratio of 15,000:1 (DCR) to ensure every pixel will stay crystal clear on the large venue even with the wide range of brightness settings. With 1.5x all-glass optical zoom lenses, the Pro8520HD can cast images up to 40% larger and deliver a higher brightness, sharper images and superior color performance. The Pro8520HD provides a multitude of connectivity options such as USB display, wired and wireless LAN display. With its advanced networking capability, the projector can project your presentations or videos using a quick and simple plug-and-play USB connection and automatically detect resolution for the best imaging experience. The HDMI digital input provides ease of connection with audio and video all in one cable. The Pro8520HD is guaranteed to project vibrant and clear images, even in high ambient light environments. The Pro8520HD supports a Crestron RoomView network management system that efficiently controls and manages all the projectors in the system from a central terminal. Through a RJ45 connection, the Pro8520HD can simultaneously display inputs from 4 different computer screens, provided all devices are connected to the same intranet. This facilitates the development of synergy among the participants. The versatile interfaces, such as HDMI, RGB, S-video, component inputs, integrated speakers, and microphone, allow the Pro8520HD to be used as an audiovisual stereo, making it the optimal solution for projection in large lecture rooms, theater conference rooms, and public demo rooms. “By developing products for different market segments, ViewSonic continues to pioneer in visual technology.” said Max Hsu, PM director for ViewSonic Asia Pacific. 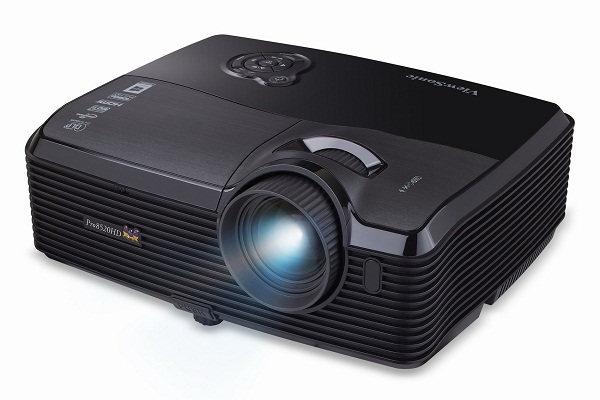 “To meet the expectations from mid- to large-size enterprieses, the latest Pro8520HD comes with high lumens, various input options, and versatile connecting interfaces to project vibrant and clear images in all kinds of business occassions and even in lecture halls or hotel ballrooms. With ViewSonic’s exclusive Crestron e-Control and RoomView Express control software, IT administrators can monitor, manage and schedule the projector remotely across a local area network. The Pro8520HD is a complete package for commercial segment to redefine the usage of high quality projection and lead a new trend in the market. Packed with 5,000 lumens and a high contrast ratio of 15,000:1 (DCR), the Pro8520HD is guaranteed to project vibrant and clear images, even in high ambient light environments. Native 1080p (1920 x 1080) resolution is perfect for the sharpest and clearest picture available. Whether for multimedia presentations, graphic design, or video production, the Pro8520HD projects crisp details and enhances presentation quality without any distortion or scaling of the original format. For large scale operations such as educational institutes and businesses, IT admin can monitor, schedule, and manage multiple projectors remotely, as well as receive projector status alerts, with the included Crestron RoomView Express control software. The Pro8520HD carries an USB Display function that provides an alternative way to set up your presentation easily and quickly by connecting your laptop to Pro8520HD through a USB cable. Equipped with dual HDMI inputs, the Pro8520HD delivers the highest picture and sound quality without any degradation. It's perfect for connecting to any HDMI-enabled devices such as smart phones, tablets, laptops, computers, and Blu-ray DVD players. ViewSonic integrates BrilliantColor technology into the Pro8520HD to construct digital colors that deliver stunning, vibrant images. The advanced 5-segment color wheel specifically enriches the performance of yellow and further augments overall color reproduction to ensure a defined picture quality. The Pro8520HD features a 1.5x all-glass optical zoom lens that enables it to cast images up to 40% larger than a conventional projector, rendering greater flexibility when mounted to the ceiling.